Submitted by Alexander Briones on Dec. 17, 2018. Photograph by chrisjtse, and published here under Creative Commons license. This guide was first published on Oct 17, 2017 and last updated on December 18, 2018. This guide is a reminder that while it is not wrong to focus on instrument quality, we should not neglect our recording gear, especially microphones. Here we feature the best overhead drum mics, based on actual market reviews and ratings data up to December of 2018. Incidentally, many of the mics listed here are versatile enough for use with other instruments, making them valuable additions to any studio setup. We've also included tips so you know what to look for in mics. If you're looking for more than just overheads, then check out our guide to The Best Drum Mic Kits. 93 out of 100. Incorporating 800+ ratings and reviews. Rode started life as Freedman Electronics all the way back in 1967, and was founded by Henry and Astrid Freeman. Freedman Electronics gradually became a leader in the Australian audio industry, going on to become one of the premier companies in the industry. After a financial downturn, Freedman Electronics began investing in creating their own line of microphones. This line of microphones went on to establish the brand's reputation. And the M5 is a good example of why this company continues to be of good repute. The cool thing about this microphone set is how seriously Rode takes their sound matching process, making them a great option if you’re going to be using these mics to record in stereo exclusively. As far as their response is concerned, these microphones are regarded to be a great fit for everything from drums to violins. In fact, many say that they actually have a tonal quality that’s surprising for their low cost. Outstanding and amazing are just two of the many positive adjectives that people use to describe the Rode M5. Even drummers who have access to more expensive overhead mics find the Rode NT5 to be more than satisfying. Many are pleased with how good it captures cymbals, but there are also reports of the M5 mic working well with guitars and other acoustic instruments. Reliability also gets a lot of thumbs up. There are a few users who wish that the mic was quieter, while others are hoping for extra features. 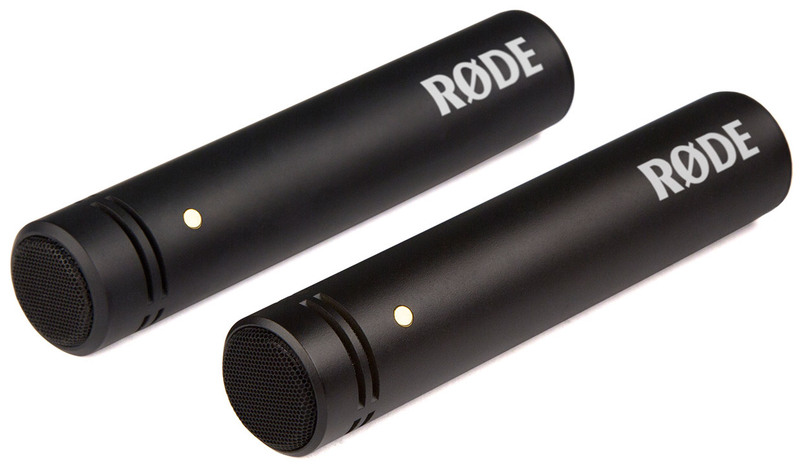 It's hard to go wrong this reasonably priced stereo condenser mic pair from Rode. A fun fact about the Rode NT series is that it’s actually named from the way the company’s microphone initially took off, described as “like a rat up a drain pipe”. The unofficial title of Rode’s first microphone was the Rodent-1, which was later changed to Rode NT-1. The most notable feature of this microphone is that it’s one of the most affordable microphones to feature gold sputtering. Gold is a very effective conductor of electricity and is highly resistant to corrosion so that it retains its conductivity for long periods, which is why you often see it on high-end audio equipment. Gold sputtering uses a thin layer of gold which helps to maintain conductivity while still keeping costs relatively low. This is especially beneficial on microphone capsules (which is where the sputtering is used on the Rode NT-5) as it allows the material to still move quickly while retaining conductive properties. This goes a long way in increasing a microphone's performance, and is likely a part of the reason why the NT-5 pair is so highly reviewed. 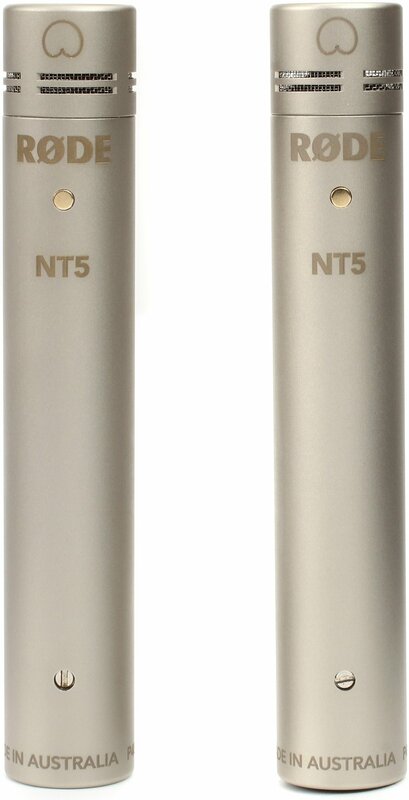 The Rode NT5 is highly regarded for its versatility, and this is corroborated by the many reports of it working well with cymbals, guitars, and even wind instruments. Many describe the sound as being very detailed, while others are impressed by how smooth the overall response is. While it's not cheap per se, most owners feel that they got more than what they paid for. There are some who feel that the mic is a little too bright when used on other sound sources. There are also a few who wish that it had a road worthy carrying case. If you're looking for a versatile overhead mic hat you can add to your home studio, then the Rode NT5 matched pair is highly recommended. The Shure KSM137 is a popular high SPL (sound pressure level) microphone, so it is not surprising for a matched pair version to get the same positive response. It features an end-address condenser cardioid design, with a three-position dB pad that changes the microphone’s input volume. This allows it to handle different degrees of loudness, from vocals, to acoustic guitars, to drums. The microphone also comes with a three-position low-frequency filter which helps to cut down background noise as well as prevent low-frequency rumble. This can be nifty when recording a bass heavy instruments or even a kick drum. Versatility is a common theme among the many owners and users who are impressed with the Shure KSM137. In addition to being good overheads, it is reported to be just as good when used with stringed instruments like the harp, violin, viola, acoustic guitar and many more. There are even reports of it working well with other percussion instruments like the xylophone, marimba, conga, and more. As expected from a Shure mic, the KSM137 also gets a lot of commendations for its reliability and solid build. There are some who feel that the mic loses some of the bottom end, but this is to be expected given its small diaphragm condenser design. The Shure KSM137 Stereo Matched Pair is definitely worth the expense if you’re serious about recording. Aside from the pedigree carried by the Shure name, the microphone has a variety of features that make it incredibly versatile in the studio. The AKG C214 Stereo Pair is an interesting pick in this list because it is a popular vocal mic, yet it versatile enough to work as overheads, and does so with much acclaim. While the 20dB pad may seem a simple enough feature, it allows the C214 to go from capturing the nuances of vocals and acoustic instruments, to handling loud cymbals. Another cool feature of this mic is its high-pass filter, which can tame excessive high frequencies, complementing its overhead use. Sound quality gets the most positive mention in reviews, seconded by the many kudos for its versatility. Even experts agree, like Mix Online’s 2009 review, in addition to doing an excellent job miking stringed instruments it has the clarity necessary to produce a great drum recording. There are a few who are turned off with what they describe as "brittle" sound, while others express caution with its SPL handling capability, given that it is a large-diaphragm mic. 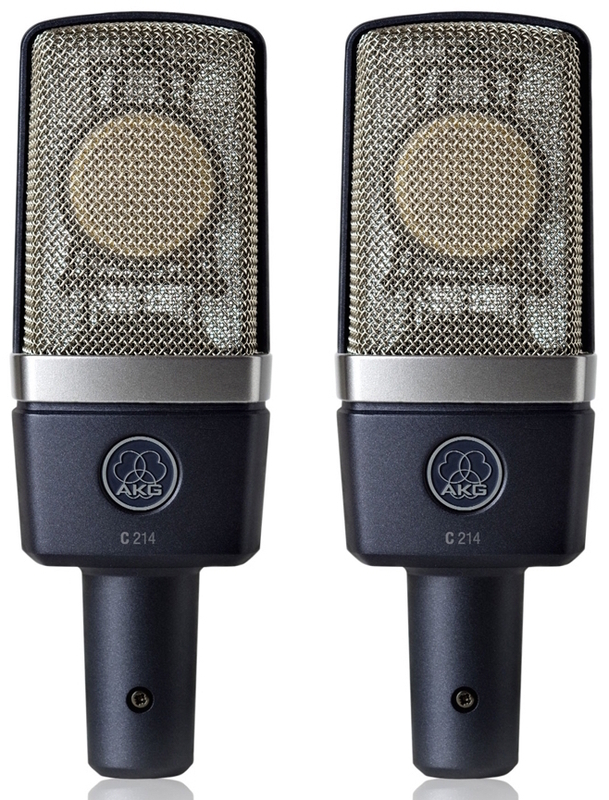 Still, most owners agree that the AKG C214 is definitely worth he look if you're looking for a versatile matched pair large diaphragm mic. Like many of the mics here, the Beyerdynamic MC 930 is engineered with versatility in mind, following the tried and tested formula of combining a small diaphragm condenser capsule with high SPL handling features. Beyerdynamic chose to equip this mic with a cardioid polar pickup pattern, which makes it easy to work with. This is complemented by the built-in pad that provides 15dB attenuation, and bass roll-off filter for taming the excess lows. Some retailers are shipping the MC 9300 with two shock mounts, two windscreens, and a carrying case, all of which add to its overall value and longevity. Most owners of this matched pair are happy with their purchase, citing transparency and overall sound quality as its best traits. While it does shine when used as overheads, there are reports of it working well with many different instruments, including vocals. There are also plenty of users who appreciate the mic's overall build quality. It also helps that the Beyerdynamic MC 930 looks good while getting the job done. Not many negatives to write about, aside from a few who wish for a discounted price tag, and more bottom end. While it does require a pretty hefty investment, those who own the Beyerdynamic MC 930 say that it is well worth the cost. 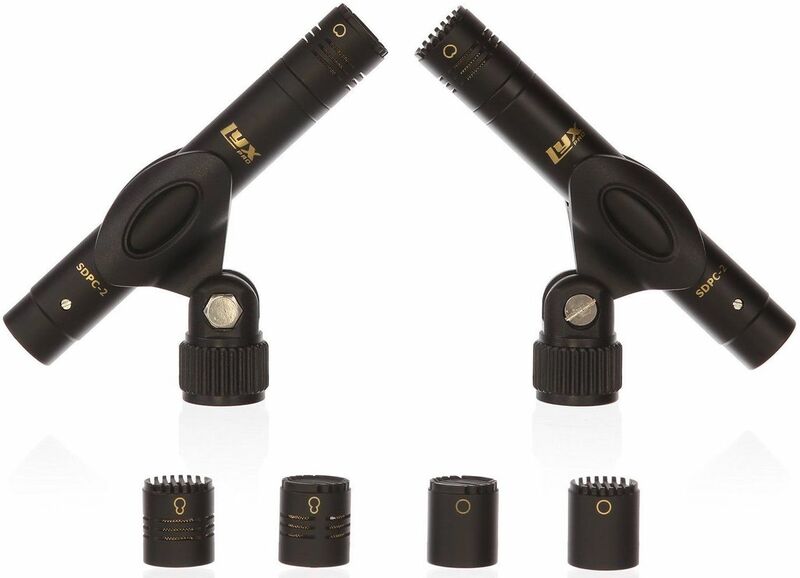 The LyxPro SDPC-2 is an affordable pair of condenser mics with interchangeable capsules. It lets you mechanically switch between 3 polar patterns, omni, cardioid and super cardioid. This adds to the LyxPros versatility and overall usage, making the already affordable price, even more attractive. 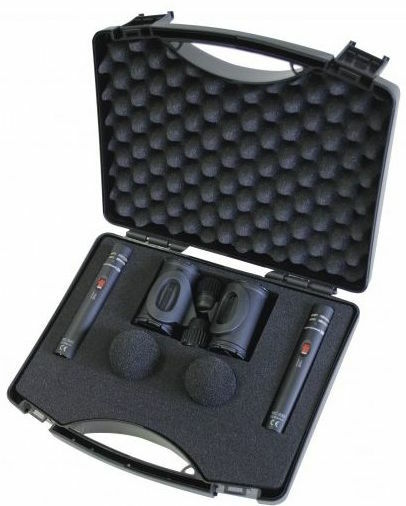 Finally, it comes bundled with 2 custom fit foam windscreens, 2 microphone clips and a nifty aluminum storage case. Extras: 2 custom fit foam windscreens, 2 microphone clips and a nifty aluminum storage case. Value for money is easily the best trait of the LyxPro SDPC-2, some tout it as the best budget stereo microphone for home studios. But it's not just about its cheap price, because many also appreciate its sound quality, describing it as flat and transparent. There are reports of it working well with cymbals, choirs, acoustic guitars and more, all of which attest to its versatility. Some users note that the sound can be a bit too bright, but then again this is to be expected with small diaphragm mics. There are also some reports of minor cosmetic issues, and a few reviews that point to build quality as a minor concern. If you're looking for a versatile and affordable stereo mic, then you can start your search with the LyxPro SDPC-2. If you want to brush up on your knowledge of overhead mics, check out the sections below! Recording is really complicated. There are so many elements that work together, and so many principles of sound that are difficult to wrap your head around, that getting a good recording can be a bit of a process for the uninitiated. A great example of this is matching your microphones when recording in stereo. The basic idea here is that an unmatched microphone causes unpleasant discrepancies in a sound, often described as a “flickering” tone. This problem is more noticeable the closer your microphones are to whatever it is you're recording, though it will be present to some degree even if you space your microphones out. This is a simplification of the issue, for a more in-depth look at this topic read this article at Sound On Sound. A good microphone is a good microphone. Unlike a lot of other gear, it really is that simple. There are going to be mics that are better for certain tasks based on the sound you’re looking for, but if you invest in a quality mic you’re going to be able to get a good tone when recording other instruments. Because of this, don’t feel like you need to cheap out on overhead mics in order to be able to purchase mics to record other instruments. You can get a mic that will record awesome vocal, guitar, and drum tracks. It may be initially more expensive, but it will save you money in the long run. When you’re shopping for microphones, you’re going to see the term “SPL rating” show up a lot. SPL stands for “sound pressure level” and is essentially a measurement of how much input volume a microphone can support before it starts to distort. SPL is actually a way to rate sound. It’s a mechanical measure of the change in air pressure as the result of a noise. Decibel is a similar in that it rates volume, but it’s actually a function of relative increase in voltage (more power=more gain=more volume). When you head someone talk about dB (spoken as “decibel”) pads, they’re talking about a button which either raises or lowers the volume of an input signal. Think about it this way, say you’re miking something really loud, like a cymbal. You’re going to want a less sensitive microphone, because a more sensitive microphone will distort. However, a less sensitive microphone won’t do a good job of capturing quieter instruments. The situation above is where a dB pad comes in. You can use the pad to make your microphone less or more sensitive based on its setting, making the microphone more versatile overall. Submitted by Jason Horton on Dec. 19, 2018.